"In his breathtaking debut, Testify, Douglas Manuel charts the raw emotional complexities and the impossible daily reckonings that confront a young black man coming of age today in America. Faced at every turn with condescending, fixed assumptions about his 'proper' role in his community and culture, the speaker faces each indictment with a stunning and searing intelligence. Each powerful testimony in this collection stands as evidence of an eloquent and dramatic new voice in American poetry." 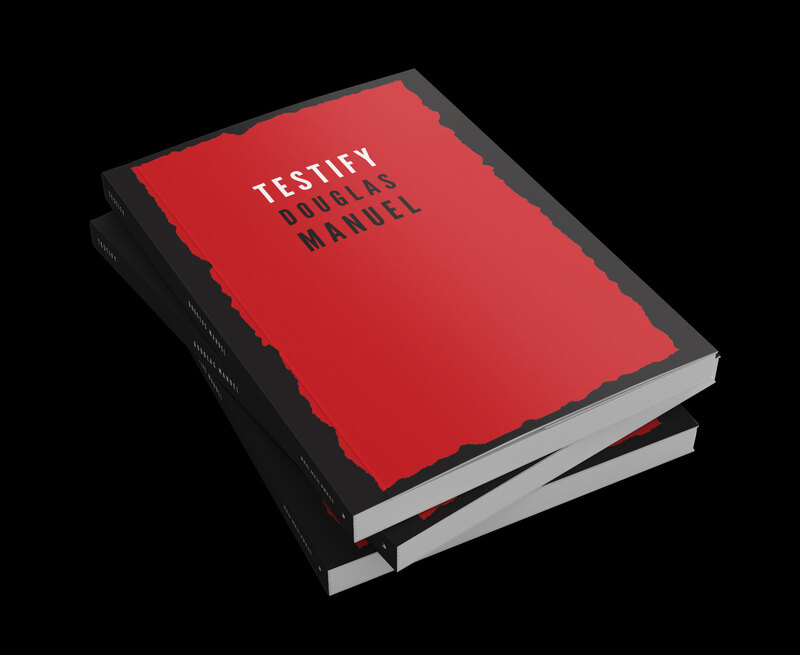 "In Douglas Manuel's Testify the act of witnessing is by turns burdensome and bittersweet, narrative and lyrical, ecstatic and irreverent. Here the holy words are the ones that offer no easy epiphanies yet grant us dazzling, off-kilter compassion and a strange, surprising grace. These potent poems testify to those ambivalent moments that might rend or right us, as when an interracial couple drive past a truck with a Confederate flag painted on its back windshield and from which a little boy turns to smile and wave: his 'blond hair // split down the middle like a Bible / left open to the Book of Psalms.'" A book of elegiac ambivalence, Testify's speaker often finds himself trapped between received binaries: black and white, ghetto and suburban, atheism and Catholicism. In many ways, this work is a Bildungsroman detailing the maturation of a black man raised in the crack-laden 1980s, with hip-hop, jazz, and blues as its soundtrack. Rendered with keen attention to the economic decline of the Midwest due to the departure of the automotive industry, this book portrays the speaker wrestling with his city's demise, family relationships, interracial love, and notions of black masculinity. Never letting anyone, including the speaker, off the hook, Testify refuses sentimentality and didacticism and dwells in a space of uncertainty, where meaning and identity are messy, complicated, and multivalent. Douglas Manuel was born in Anderson, Indiana. He received a BA in Creative Writing from Arizona State University and a MFA from Butler University where he was the Managing Editor of Booth a Journal. He is currently a Middleton and Dornsife Fellow at the University of Southern California where he is pursuing a PhD in Literature and Creative Writing. He has served as the Poetry Editor for Gold Line Press as well as one of the Managing Editors of Ricochet Editions. His poems are featured on Poetry Foundation's website and have appeared or are forthcoming in Poetry Northwest, The Los Angeles Review, Superstition Review, Rhino, North American Review, The Chattahoochee Review, New Orleans Review, Crab Creek Review, and elsewhere. His first full length collection of poems, Testify (Red Hen Press, 2017), won the 2017 IBPA Benjamin Franklin Award for poetry. "Are You Ready to Help the Parents of this Child in their Duty as Christian Parents?" Some of my must read books for April 2018. Intersection of Lankershim Blvd. & Magnolia Blvd. Poetry Reading and Workshops May 25th-June 3rd. Poetry Reading and Workshops September 28th-30th.